TamilNadu Government Recruitment 2019 has been announced for the below vacancies. Read the following Job Notification details to get a clear idea about Registration process, Eligibility, Qualification, How to apply, No of Vacancies, Salary, Job Location, Links to apply, Selection procedure, age limit and all the instructions before applying for this job. The Government of Tamil Nadu is the governing authority for the Indian state of Tamil Nadu. It is seated at Fort St George, Chennai. The legislature of Tamil Nadu was bicameral until 1986, when it was replaced by a unicameral legislature, like most other states in India.The Governor is the constitutional head of state while the Chief Minister heads the council of ministers. The Chief Justice of the Madras High Court is the head of the judiciary. 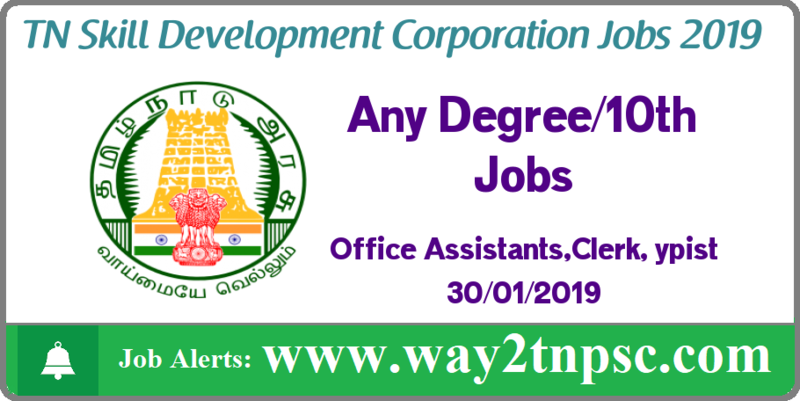 The above Notification ( TNSDC Recruitment 2019 - Office Assistant Posts | Apply online ) briefly describes about the details of latest announcement or notification includes important dates like release date , last date of application submission, details regarding fees, exam timings. Candidates, check all the needs and apply accordingly.